Treatment with metoclopramide for longer than 12 weeks should be avoided in all but rare cases where therapeutic benefit is thought to outweigh the risk of developing tardive dyskinesia (see WARNINGS). Metoclopramide Injection, USP is a sterile, nonpyrogenic solution of metoclopramide hydrochloride in water for injection. Each milliliter contains metoclopramide base 5 mg (as the hydrochloride monohydrate); 8.5 mg sodium chloride. May contain hydrochloric acid and/or sodium hydroxide for pH adjustment; pH 4.4 (2.5 to 6.5). The solution contains no bacteriostat, antimicrobial agent or added buffer and is intended for use only as a single-use injection. When smaller doses are required, the unused portion should be discarded. Metoclopramide Injection is intended for intravenous or intramuscular administration. The onset of pharmacological action of metoclopramide is 1 to 3 minutes following an intravenous dose, 10 to 15 minutes following intramuscular administration, and 30 to 60 minutes following an oral dose, pharmacological effects persist for 1 to 2 hours. Metoclopramide is rapidly and well absorbed. Relative to an intravenous dose of 20 mg, the absolute oral bioavailability of metoclopramide is 80% ± 15.5% as demonstrated in a crossover study of 18 subjects. Peak plasma concentrations occur at about 1 to 2 hours after a single oral dose. Similar time to peak is observed after individual doses at steady state. In a single-use study of 12 subjects, the area under the drug concentration-time curve increases linearly with doses from 20 to 100 mg. Peak concentrations increase linearly with dose; time to peak concentrations remains the same; whole body clearance is unchanged; and the elimination rate remains the same. The average elimination half-life in individuals with normal renal function is 5 to 6 hours. Linear kinetic processes adequately describe the absorption and elimination of metoclopramide. Approximately 85% of the radioactivity of an orally administered dose appears in the urine within 72 hours. Of the 85% eliminated in the urine, about half is present as free or conjugated metoclopramide. In an open-label study, six pediatric patients (age range, 3.5 weeks to 5.4 months) with GER received metoclopramide 0.15 mg/kg oral solution every 6 hours for 10 doses. The mean peak plasma concentration of metoclopramide after the tenth dose was 2-fold (56.8 mcg/L) higher compared to that observed after the first dose (29 mcg/L) indicating drug accumulation with repeated dosing. After the tenth dose, the mean time to reach peak concentrations (2.2 hrs), half-life (4.1 hrs), clearance (0.67 L/h/kg), and volume of distribution (4.4 L/kg) of metoclopramide were similar to those observed after the first dose. In the youngest patient (age, 3.5 weeks), metoclopramide half-life after the first and the tenth dose (23.1 and 10.3 hrs, respectively) was significantly longer compared to other infants due to reduced clearance. This may be attributed to immature hepatic and renal systems at birth. Single intravenous doses of metoclopramide 0.22 to 0.46 mg/kg (mean, 0.35 mg/kg) were administered over 5 minutes to nine pediatric cancer patients receiving chemotherapy (mean age, 11.7 years; range, 7 to 14 yrs) for prophylaxis of cytotoxic-induced vomiting. The metoclopramide plasma concentrations extrapolated to time zero ranged from 65 to 395 mcg/L (mean, 152 mcg/L). The mean elimination half-life, clearance, and volume of distribution of metoclopramide were 4.4 hrs (range, 1.7 to 8.3 hrs), 0.56 L/h/kg (range, 0.12 to 1.20 L/h/kg), and 3.0 L/kg (range, 1.0 to 4.8 L/kg), respectively. In another study, nine pediatric cancer patients (age range, 1 to 9 yrs) received 4 to 5 intravenous infusions (over 30 minutes) of metoclopramide at a dose of 2 mg/kg to control emesis. After the last dose, the peak serum concentrations of metoclopramide ranged from 1060 to 5680 mcg/L. The mean elimination half-life, clearance, and volume of distribution of metoclopramide were 4.5 hrs (range, 2.0 to 12.5 hrs), 0.37 L/h/kg (range, 0.10 to 1.24 L/h/kg), and 1.93 L/kg (range, 0.95 to 5.50 L/kg), respectively. Metoclopramide is indicated for the relief of symptoms associated with acute and recurrent diabetic gastric stasis. Metoclopramide Injection, USP is indicated for the prophylaxis of vomiting associated with emetogenic cancer chemotherapy. Metoclopramide Injection, USP is indicated for the prophylaxis of postoperative nausea and vomiting in those circumstances where nasogastric suction is undesirable. Metoclopramide Injection, USP may be used to facilitate small bowel intubation in adults and pediatric patients in whom the tube does not pass the pylorus with conventional maneuvers. Metoclopramide Injection, USP may be used to stimulate gastric emptying and intestinal transit of barium in cases where delayed emptying interferes with radiological examination of the stomach and/or small intestine. Metoclopramide should not be used whenever stimulation of gastrointestinal motility might be dangerous, e.g., in the presence of gastrointestinal hemorrhage, mechanical obstruction or perforation. Acute dystonic reactions occur in approximately 1 in 500 patients treated with the usual adult dosages of 30 to 40 mg/day of metoclopramide. These usually are seen during the first 24 to 48 hours of treatment with metoclopramide, occur more frequently in pediatric patients and adult patients less than 30 years of age and are even more frequent at the higher doses used in prophylaxis of vomiting due to cancer chemotherapy. These symptoms may include involuntary movements of limbs and facial grimacing, torticollis, oculogyric crisis, rhythmic protrusion of tongue, bulbar type of speech, trismus, or dystonic reactions resembling tetanus. Rarely, dystonic reactions may present as stridor and dyspnea, possibly due to laryngospasm. If these symptoms should occur, inject 50 mg Benadryl® (diphenhydramine hydrochloride) intramuscularly, and they usually will subside. Cogentin® (benztropine mesylate), 1 to 2 mg intramuscularly, may also be used to reverse these reactions. Treatment with metoclopramide can cause tardive dyskinesia (TD), a potentially irreversible and disfiguring disorder characterized by involuntary movements of the face, tongue, or extremities. The risk of tardive dyskinesia increases with the duration of treatment and the total cumulative dose. An analysis of utilization patterns showed that about 20% of patients who used metoclopramide took it longer than 12 weeks. Treatment with metoclopramide for longer than the recommended 12 weeks should be avoided in all but rare cases where therapeutic benefit is thought to outweigh the risk of developing TD. Parkinsonian-like symptoms, including bradykinesia, tremor, cogwheel rigidity, or mask-like facies, have occurred, more commonly within the first 6 months after beginning treatment with metoclopramide, but occasionally after longer periods. These symptoms generally subside within 2 to 3 months following discontinuance of metoclopramide. Patients with pre-existing Parkinson's disease should be given metoclopramide cautiously, if at all, since such patients may experience exacerbation of parkinsonian symptoms when taking metoclopramide. In one study in hypertensive patients, intravenously administered metoclopramide was shown to release catecholamines, hence, caution should be exercised when metoclopramide is used in patients with hypertension. Intravenous administration of Metoclopramide Injection, USP, diluted in a parenteral solution should be made slowly over a period of not less than 15 minutes. A patient Medication Guide is available for metoclopramide. The prescriber or health professional should instruct patients, their families, and their caregivers to read the Medication Guide and should assist them in understanding its contents. Patients should be given the opportunity to discuss the contents of the Medication Guide and to obtain answers to any questions they may have. Refer to the accompanying Medication Guide. The effects of metoclopramide on gastrointestinal motility are antagonized by anticholinergic drugs and narcotic analgesics. Additive sedative effects can occur when metoclopramide is given with alcohol, sedatives, hypnotics, narcotics or tranquilizers. Reproduction studies performed in rats, mice, and rabbits by the IM, IV, subcutaneous (SC), and oral routes at maximum levels ranging from 12 to 250 times the human dose have demonstrated no impairment of fertility or significant harm to the fetus due to metoclopramide. There are, however, no adequate and well-controlled studies in pregnant women. Because animal reproduction studies are not always predictive of human response, this drug should be used during pregnancy only if clearly needed. Care should be exercised in administering metoclopramide to neonates since prolonged clearance may produce excessive serum concentrations (see CLINICAL PHARMACOLOGY – Pharmacokinetics). In addition, neonates have reduced levels of NADH-cytochrome b5 reductase which, in combination with the aforementioned pharmacokinetic factors, make neonates more susceptible to methemoglobinemia (see OVERDOSAGE). The safety profile of metoclopramide in adults cannot be extrapolated to pediatric patients. Dystonias and other extrapyramidal reactions associated with metoclopramide are more common in the pediatric population than in adults (see WARNINGS and ADVERSE REACTIONS – Extrapyramidal Reactions (EPS)). Clinical studies of metoclopramide did not include sufficient numbers of subjects aged 65 and over to determine whether elderly subjects respond differently from younger subjects. The risk of developing parkinsonian-like side effects increases with ascending dose. Geriatric patients should receive the lowest dose of metoclopramide that is effective. If parkinsonian-like symptoms develop in a geriatric patient receiving metoclopramide, metoclopramide should generally be discontinued before initiating any specific anti-parkinsonian agents (see WARNINGS). The elderly may be at greater risk for tardive dyskinesia (see WARNINGS – Tardive Dyskinesia). Sedation has been reported in metoclopramide users. Sedation may cause confusion and manifest as over-sedation in elderly (see CLINICAL PHARMACOLOGY, PRECAUTIONS – Information for Patients and ADVERSE REACTIONS – CNS Effects). Metoclopramide is known to be substantially excreted by the kidney, and the risk of toxic reactions to this drug may be greater in patients with impaired renal function (see DOSAGE AND ADMINISTRATION – Use in Patients with Renal or Hepatic Impairment). For these reasons, dose selection for an elderly patient should be cautious, usually starting at the low end of the dosing range, reflecting the greater frequency of decreased renal function, concomitant disease, or other drug therapy in the elderly (see DOSAGE AND ADMINISTRATION – Use in Patients with Renal or Hepatic Impairment). In general, the incidence of adverse reactions correlates with the dose and duration of metoclopramide administration. The following reactions have been reported, although in most instances, data do not permit an estimate of frequency. Restlessness, drowsiness, fatigue and lassitude may occur in patients receiving the recommended prescribed dosage of metoclopramide injection. Insomnia, headache, confusion, dizziness, or mental depression with suicidal ideation also may occur (see WARNINGS). In cancer chemotherapy patients being treated with 1 to 2 mg/kg per dose, incidence of drowsiness is about 70%. There are isolated reports of convulsive seizures without a clear-cut relationship to metoclopramide. Rarely, hallucinations have been reported. Acute dystonic reactions, the most common type of EPS associated with metoclopramide, occur in approximately 0.2% of patients (1 in 500) treated with 30 to 40 mg of metoclopramide per day. In cancer chemotherapy patients receiving 1 to 2 mg/kg per dose, the incidence is 2% in patients over the ages of 30 to 35, and 25% or higher in pediatric patients and adult patients less than 30 years of age who have not had prophylactic administration of diphenhydramine. Symptoms include involuntary movements of limbs, facial grimacing, torticollis, oculogyric crisis, rhythmic protrusion of tongue, bulbar type of speech, trismus, opisthotonus (tetanus-like reactions) and rarely, stridor and dyspnea, possibly due to laryngospasm; ordinarily these symptoms are readily reversed by diphenhydramine (see WARNINGS). Tardive dyskinesia most frequently is characterized by involuntary movements of the tongue, face, mouth or jaw, and sometimes by involuntary movements of the trunk and/or extremities; movements may be choreoathetotic in appearance (see WARNINGS). Motor restlessness (akathisia) may consist of feelings of anxiety, agitation, jitteriness, and insomnia, as well as inability to sit still, pacing, and foot tapping. These symptoms may disappear spontaneously or respond to a reduction in dosage. Hypotension, hypertension, supraventricular tachycardia, bradycardia, fluid retention, acute congestive heart failure, and possible atrioventricular (AV) block (see CONTRAINDICATIONS and PRECAUTIONS). A few cases of neutropenia, leukopenia, or agranulocytosis, generally without a clear-cut relationship to metoclopramide. Methemoglobinemia, in adults and especially with overdosage in neonates (see OVERDOSAGE). Sulfhemoglobinemia in adults. Unintentional overdose due to misadministration has been reported in infants and children with the use of metoclopramide syrup. While there was no consistent pattern to the reports associated with these overdoses, events included seizures, extrapyramidal reactions and lethargy. Methemoglobinemia has occurred in premature and full-term neonates who were given overdoses of metoclopramide (1 to 4 mg/kg/day orally, intramuscularly or intravenously for 1 to 3 or more days). Methemoglobinemia can be reversed by the intravenous administration of methylene blue. However, methylene blue may cause hemolytic anemia in patients with G6PD deficiency, which may be fatal (see PRECAUTIONS – Other Special Populations). The preferred parenteral solution is Sodium Chloride Injection (normal saline), which when combined with Metoclopramide Injection, USP, can be stored frozen for up to 4 weeks. Metoclopramide Injection, USP is degraded when admixed and frozen with Dextrose-5% in Water. Metoclopramide Injection, USP diluted in Sodium Chloride Injection, Dextrose-5% in Water, Dextrose-5% in 0.45% Sodium Chloride, Ringer's Injection, or Lactated Ringer's Injection may be stored up to 48 hours (without freezing) after preparation if protected from light. All dilutions may be stored unprotected from light under normal light conditions up to 24 hours after preparation. The recommended single use is: Pediatric patients above 14 years of age and adults – 10 mg metoclopramide base. Pediatric patients (6 to 14 years of age) – 2.5 to 5 mg metoclopramide base; (under 6 years of age) – 0.1 mg/kg metoclopramide base. In patients where delayed gastric emptying interferes with radiological examination of the stomach and/or small intestine, a single use may be administered slowly by the intravenous route over a 1 to 2 minute period. Protect from light by retaining in package until time of use. Do not store open single-use vials for later use, as they contain no preservative. Discard unused portion. Benadryl® is a registered trademark of Warner-Lambert Company. Cogentin® is a registered trademark of Merck & Co., Inc.
You or your caregiver should read the Medication Guide before you start receiving metoclopramide injection and before you get another dose of metoclopramide injection. There may be new information. If you take another product that contains metoclopramide (such as metoclopramide tablets, metoclopramide orally disintegrating tablets, or metoclopramide oral solution), you should read the Medication Guide that comes with that product. Some of the information may be different. This Medication Guide does not take the place of talking to your doctor about your medical condition or your treatment. Abnormal muscle movements called tardive dyskinesia (TD). These movements happen mostly in the face muscles. You can not control these movements. They may not go away even after stopping metoclopramide. There is no treatment for TD, but symptoms may lessen or go away over time after you stop taking metoclopramide. the longer you take metoclopramide and the more metoclopramide you take. You should not take metoclopramide for more than 12 weeks. It is not possible for your doctor to know if you will get TD if you take metoclopramide. to help empty stomach contents or to help barium move through your intestine, when you get an X-ray examination of the stomach or small intestine. It is not known if metoclopramide is safe and works in children except when used to help insert a tube into the small intestine. Who should not receive metoclopramide? are allergic to metoclopramide or anything in it. 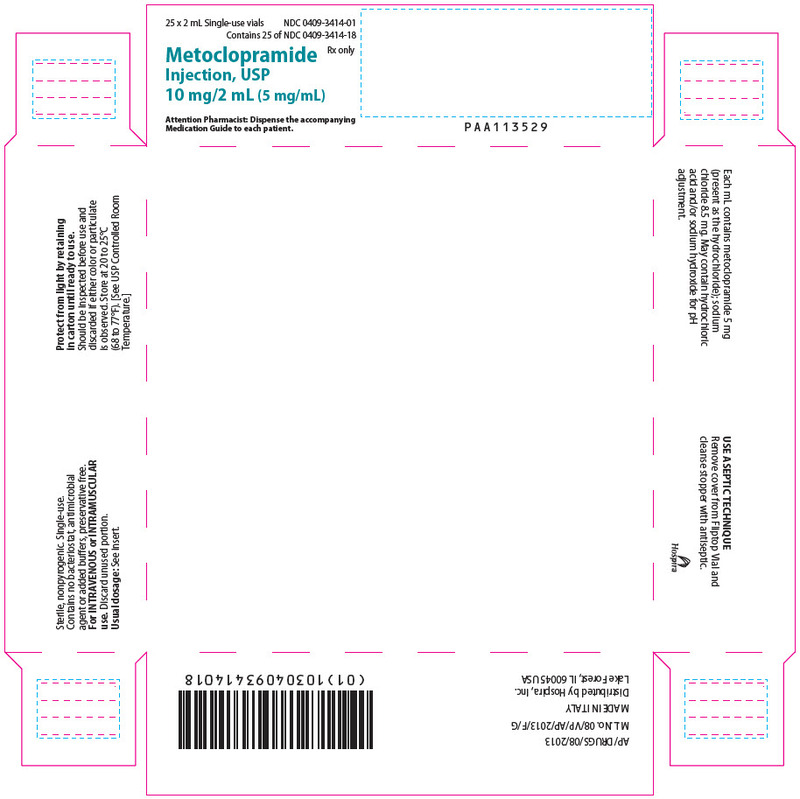 See the end of this Medication Guide for a list of ingredients in metoclopramide. What should I tell my doctor before receiving metoclopramide? liver problems or heart failure. Metoclopramide may cause your body to hold fluids. you are pregnant or plan to become pregnant. It is not known if metoclopramide will harm your unborn child. you are breastfeeding. Metoclopramide is passed into human milk and may harm your baby. Talk with your doctor about the best way to feed your baby if you take metoclopramide. Tell your doctor about all the medicines you take, including prescription and non-prescription medicines, vitamins and herbal supplements. Metoclopramide and some other medicines can affect each other and may not work as well, or cause possible side effects. Do not start any new medicines while receiving metoclopramide until you talk with your doctor. How will I receive metoclopramide? Metoclopramide will be given to you by intravenous (IV) infusion into your vein or by intramuscular (IM) injection into a large muscle. Where and how you receive your metoclopramide injection (IV or IM) will depend on why you are receiving it. Certain side effects can happen if metoclopramide is given too fast. See the section " What are the possible side effects of metoclopramide?" You should not take or receive metoclopramide for more than 12 weeks. What should I avoid while receiving metoclopramide? Do not drink alcohol while receiving metoclopramide. Alcohol may make some side effects of metoclopramide worse, such as feeling sleepy. Do not drive, work with machines, or do dangerous tasks until you know how metoclopramide affects you. Metoclopramide may cause sleepiness. Abnormal muscle movements. See the section " What is the most important information I should know about metoclopramide?" Depression, thoughts about suicide, and suicide. Some people who take metoclopramide become depressed. You may have thoughts about hurting or killing yourself. Some people who take metoclopramide have ended their own lives (suicide). Parkinsonism. Symptoms include slight shaking, body stiffness, trouble moving or keeping your balance. If you already have Parkinson's disease, your symptoms may become worse while you are receiving metoclopramide. Infusion related side effects can happen if metoclopramide is given too fast. You may feel very anxious and restless for a short time, and then become sleepy while you are receiving a dose of metoclopramide. Tell your doctor or nurse right away if this happens. Tell your doctor about any side effects that bother you or do not go away. These are not all the possible side effects of metoclopramide. This Medication Guide summarizes the most important information about metoclopramide. If you would like more information about metoclopramide, talk with your doctor. You can ask your doctor or pharmacist for information about metoclopramide that is written for healthcare professionals. For more information go to www.hospira.com or call 1-800-615-0187. For I.V. or I.M. use.